What a wonderful couple days full of nonstop quilting and a lot of fun! You wouldn't believe just how exhausting it is to spend an entire weekend quilting! I left on Friday and came home on Sunday. We sewed, we ate, we laughed and we had fun. What more could you ask for? Okay, well fabric shopping and we did that too! I did make progress on the two quilts I brought, but didn't get close to finishing either of them. One has four different sizes of Churn Dash blocks and it it so time consuming. The other I didn't start until late Saturday. In between a stack of blocks I would do a paper pieced block as a way of 'cleansing'. It helped! I hope to share all of these projects in various stages as I work through them. 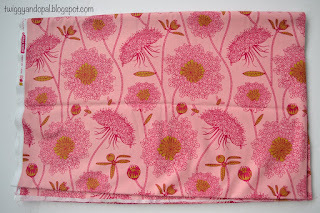 For now, I'll share my fabric haul and a few tidbits from the retreat! It looks pretty empty in this picture! It was early in the day on Friday, many people had yet to arrive. The room was huge as you can see. Plenty of space for everyone and a fully functional kitchen it the back. The lighting was pretty awful though! I highly, highly recommend bringing a small lamp just in case. It didn't help that there wasn't a ray of sun until the last day either. We ended up binging in lamps from our cabins and rooms! There was enough food to feed an army...we did not go hungry! Fridays was our 'Social'. Food, wine and wild, wild women...maybe not the wild women part! I think everyone had fun. I know I did. I enjoyed the laughter, the projects, the fabric and the company. I hope we do it again next year! 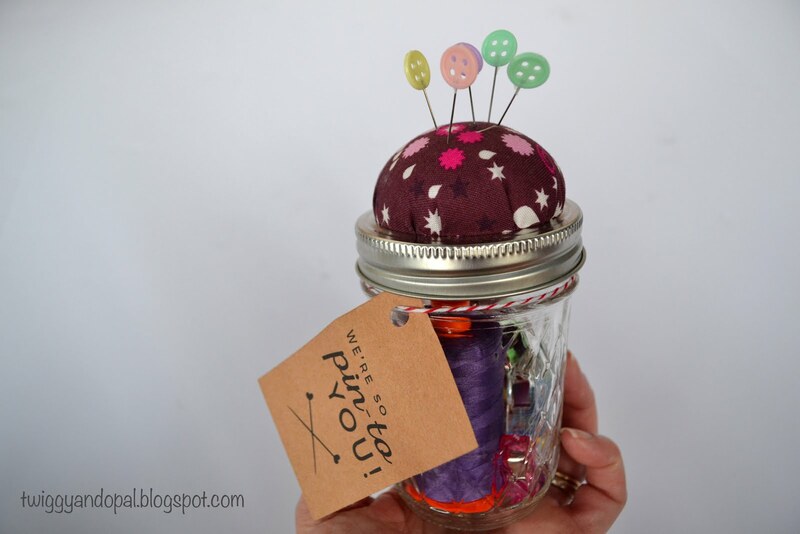 Each attendee received this little pin cushion jar filled with treats and tricks! The thread donated by Aurifil fit perfectly inside the jar! 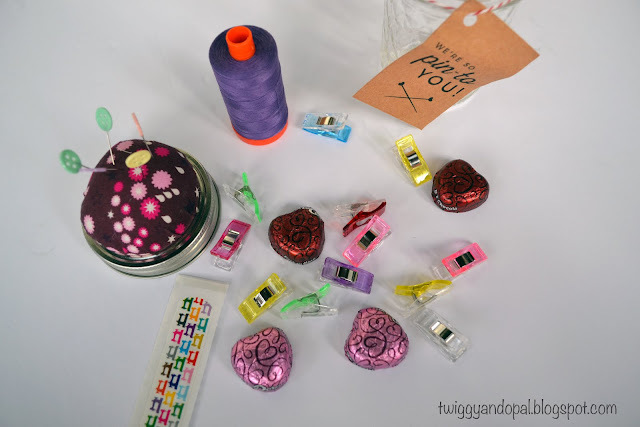 Clips, thread, pins, chocolate and band-aids! All the essentials for a quilting retreat! 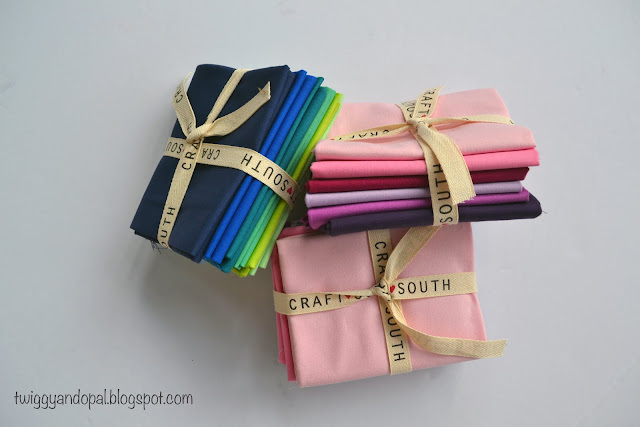 We were so, so lucky to have Elizabeth bring fabric to us from Craft South! It was so much fun to touch and feel, and drool a little bit! There was the newest Anna Maria Horner Collection 'Sweet Dreams', Carolyn Friedlander 'Gleaned' and some Cotton + Steal to round it out. Also, solid bundles and even some yarn! Emily took time away from her sewing machine to be the designated cutter...and she cut a lot of fabric that day! My haul is pretty amazing! I have to say if you haven't seen 'Sweet Dreams' in person, you can't appreciate how amazing the colors are. It's a beautiful collection! You can't tell much from this picture! I am not quite ready to bust it open! One day, right?! I did buy yardage of these two prints. The first will eventually be used for a backing. Mmmm...just delicious! I picked up a few pieces of 'Gleaned' for my stash. The second and third cuts are pretty amazing in person. They appear to shimmer, yet they are not metallic. Very, very pretty! Lastly, some solids. The bundles were too pretty to pass up! Plus, there is some purple/violet shades that may work for the Pantone Color of the Year Challenge: Ultra Violet. Thinking ahead! That's about it! There is nothing better than getting home after time away. I was sad the retreat was over, but happy to get back to my space! Sewing, bathroom and bed! As with any trip, getting a good nights sleep the first night is nearly impossible! I tossed, turned and actually had a nightmare! My scream actually woke me up! So strange...sorry roommates! Worth it? Oh, hell yeah! There is something about being in a room with so many like minded people. I learned, listened, laughed and lounged! What more could you ask for! It sounds great Jayne: I go to mini retreats with two friends but I would like to go on a bigger retreat with my modern guild. Cutest bandaids ever! Sweet dreams--yes, please!!! Looks and sounds like you had a wonderful time! Such a shame about the lighting but it sounds like it didn't stop you from having a wonderful time. 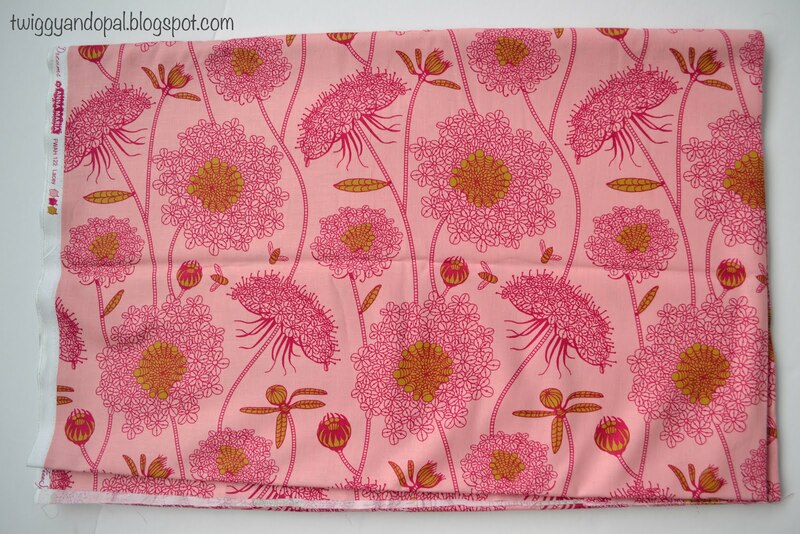 Lovely fabrics you bought, Gleaned is beautiful and I really like the pink one you will use as backing. Now you are returned relaxed and refreshed, whatever will your imagination dream up next! Retreats must be the best! 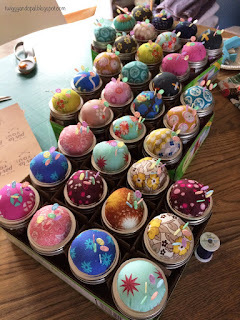 I used to do small ones with embroidery friends, but must check out the sewing variety! Especially if someone else is doing the cooking! That sounds wonderful. 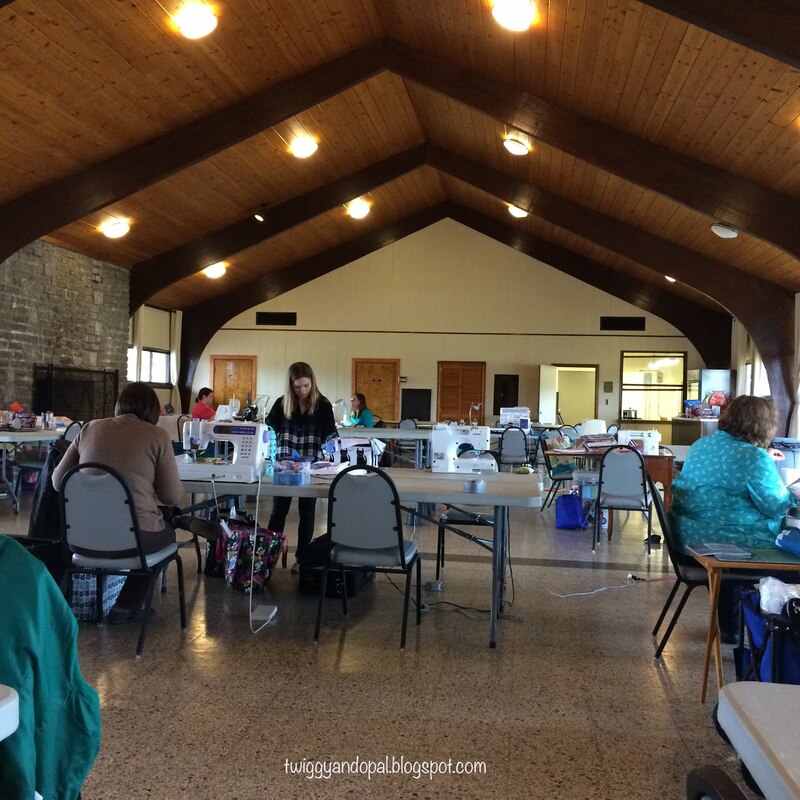 There's nothing like a quilting retreat. 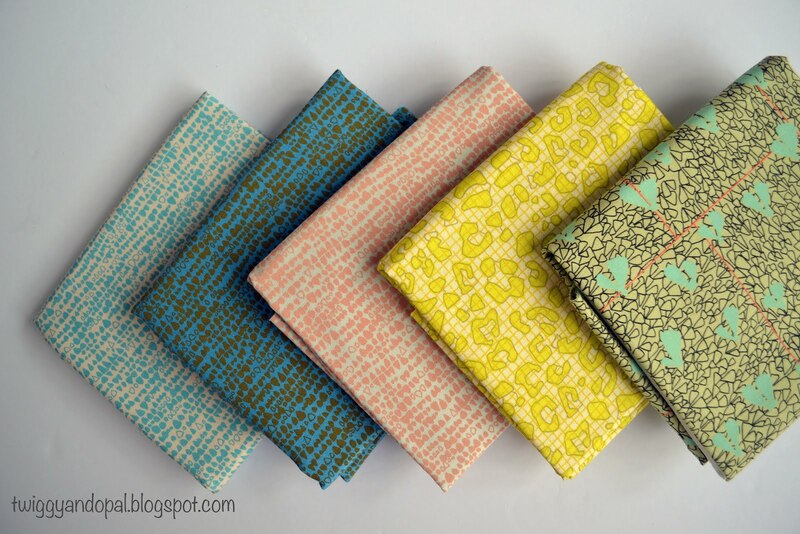 You sure ended up with some gorgeous fabrics! Oh, my goodness, I had a nightmare at the last retreat I went to, too! Poor roommates is right! Retreats are so much fun. The pin cushion jars were great party favours. Hope you got some sleep this week. I'm so glad you enjoyed the retreat so thoroughly. I think your idea to bring a nice lamp or light is spot on.